Enable process status – When enabled, the Process feature will be turned on. Enable Shipped status – When enabled, the Ship feature will be turned on. 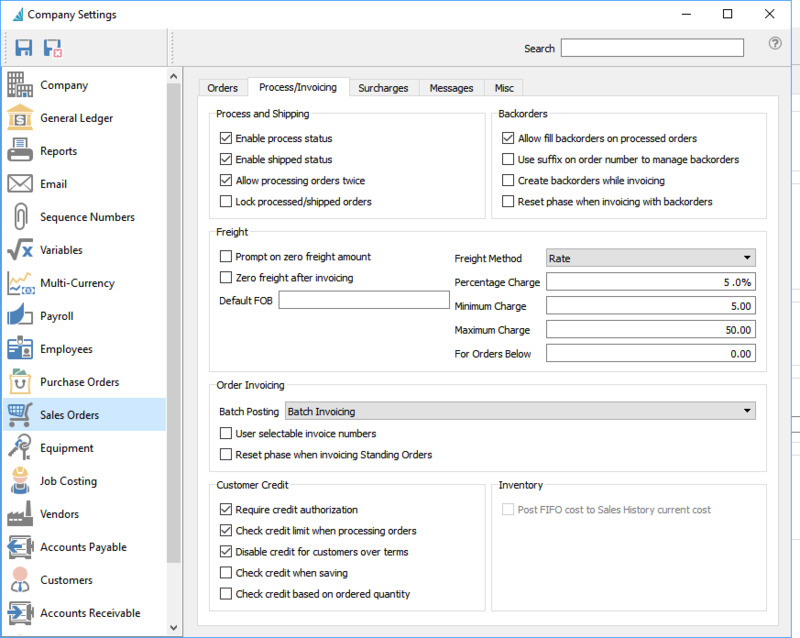 Allow processing orders twice – Will allow an order to be processed more than once if the user has override security setting. Lock processed orders – If an order is processed, it cannot be edited without the correct user setting. Prompt on zero freight amount – Warns user if they try to invoice an order without freight. Zero freight after invoicing – After an invoice is generated and if there are back orders, the freight will get zeroed out. Percentage Charge – % charged on shipping method by default. Minimum Charge – Minimum freight charged. Maximum Charge – Maximum freight charged. For Orders Below – Freight only charged if sales order is below this amount. *NOTE: Above freight settings are overridden by the same settings that can be applied to each shipping method. Live Posting – Order gets posted as soon as the user clicks invoice. Batch Posting – Order gets an invoice number added to it when the user clicks invoice, however, they stay in orders until someone ‘batches’ them. With this option, the invoice can be corrected/edited up until the user posts the batch. User selectable invoice numbers – Users can override the next invoice number. It gets added to the sales order before invoicing and can be an alphanumeric number that has not yet been used. Reset phase when invoicing standing orders – Phase gets reset each time the standing order gets invoiced. Require credit authorization –Orders/invoices must be credit authorized before they can be saved and/or invoiced. Check credit limit when processing orders – Credit is checked when order is processed. Disable credit for customers over terms – Credit is checked for terms in addition to credit limit. Check credit when saving – Credit is checked when the order is saved, not just processed. Check credit based on ordered quantity – Credit check is based on the order value instead of just the value that can be shipped. It includes back ordered items. Post FIFO Cost to Sales History Current Cost – FIFO gets posted to current cost in sales history. Allow fill back orders on processed orders – Will ship items on a processed order if the items are now in stock. *Not recommended as the order may already be picked. Use suffix on order number to manage backorders – All sales orders will start with a -0 and will increment each time an order is invoiced and still has back orders. It goes as high as –Z. Create back orders while invoicing – If using batch invoicing, a new order will get created on invoicing instead of when the invoice gets batch posted. Reset phase when invoicing with back orders.